This page was started to keep track of all the meals that me and my girlfriend put together in her kitchen. I don't get to cook that much at home, so I use her place as a means to express my cooking ideas. We like exotic, and we only take ideas from recipes than follow them to the exact instructions. This gives us breathing room to experiment, and make mistakes, and learn a little more. Cut up peppers, onion, and celery first. Melt butter in a large pot. Fry the peppers, onions, and celery in the butter first, then add Okra last. Slowly cook vegetables. Slowly add broth as the mixture boils. Add the mushrooms, and broth a little at a time. Add condensed soup and sour cream. Then add seasonings, such as sea salt, black crushed pepper, and what ever else to make delicious. Cut up vegetables small, and cook them in a large pot in the half stick of butter. Once cooked add the corn soup into the pot and stir as it boils. Next add the condensed cheese soup, and stir repeatedly as it boils. Add the crab and the shrimp last. Season with Old bay sparringly, and add dried parsely, and basil, black crushed pepper, and kosher salt. Makes 3 gallons of soup. 1/4 pack of dried seeweed. a few dashes of Tamari soy sauce. This soup was experimental, and I got the ideas from different recipes on the internet. I am skeptical about how authentic this recipe is, but I can tell you one thing that it is very unschooled. Although the soup went down very well with my girlfriend and her family, and her co-workers at her job. I can say one thing that it must be really healthy with all the seaweed, mushrooms, and tofu. The only thing I was worried about was the MSG in the soup stock(Hon Dashi) that I used. I am not really familiar with their soup mixes so I was sure what to buy, and what was in my budget. This whole concoction cost about 30 dollars. First my girlfriend took the mushrooms, and soaked them in the chicken broth for a few hours. They should be really soft when they have been soaking. Next step cut them into 2 or three pieces, and remove the stem, cause they are too chewy. Do not dump the broth. Take the broth, and the cut up mushrooms, and put them in a large soup pot. Add a small pot of water and bring to a boil. As the water heats up put a packet of the Hon Dashi into the pot. Along side of the soup pot, boil the vermicelli on a different pilot. You are supposed to boil it for 9 minutes although I feel it takes less time to make it soft than spaghetti, You can probably just add it to the soup and it will boil in there. Next throw the frozen shrimp into the pot. As the water boils, add another pot of water, and then add the dried seeweed. Use the seeweed sparingly, cause it expands as it hydrates. Add it a little at a time, or you will have much more than you expected. I also think that the seeweed should be hacked into pieces preferably, cause they get tangled up in long strips. Next cut up the the tofu into small cubes, and dump one pack at a time into the broth. I kept adding more water to make the soup go farther, or you could use another can or box of chicken broth to give it more flavor. Last add a few dashes of the soy sauce. The key to this recipe is too use your noggin about how much to add. I used two packs of the soup stock, but you should season to taste. The seeweed is tricky, so don't add too much, and add as much vermacelli as you want. I was worried that although it is a tasty, but slightly murky soup, I thought it might get sickening after having a few bowls of it, cause it is something I am not used to eating. But all in all I kept consuming it days after I made it. I knew my mom wouldn't go for it, but like I said it is a very healthy, lite soup. There are things that I could do to improve this recipe, like using large fresh shrimp. 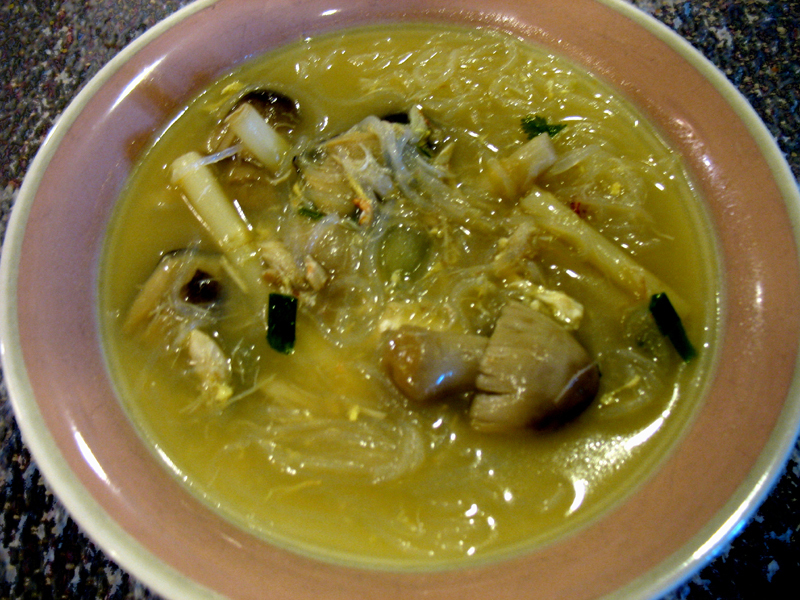 Also maybe substituting the dashi with somthing with less MSG, although that is what gives the broth a very asian flair. 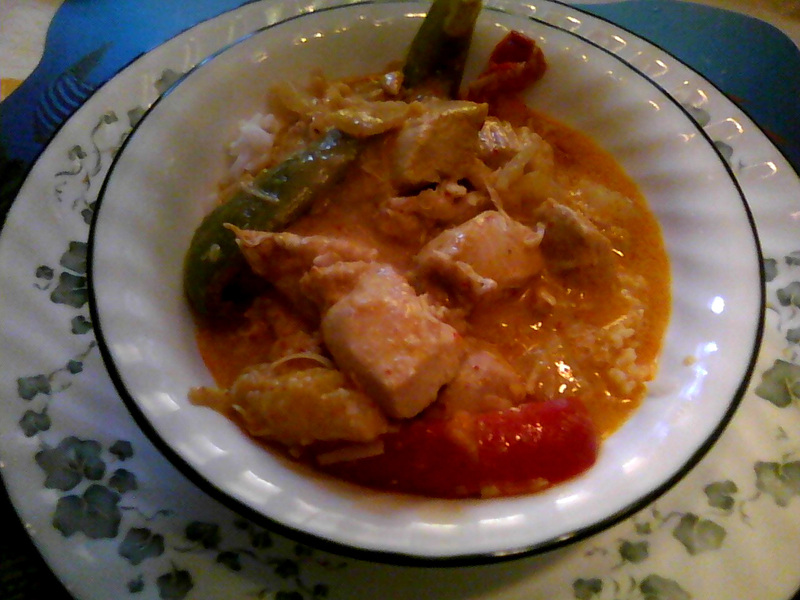 This stew was derived from an authentic Thai soup recipe, that I prepared. I thought that there could have been more vegetables in the original recipe to make it more hardy and balanced. The original recipe was tasty, so I would imagine that along with all the vegetables, it will be more of a success, and a meal by itself. 1 pack of chicken breasts, cut into bite sized cubes, and pounded. 3-4 tablespoons of coconut sugar. First stirfry 1 to 2 whole cans of green curry paste(or depending on how spicy you like it), with the habeneros in some vegetable oil in a large pot until fragrant on medium heat. Add 1 can of coconut very gradually. Next add the chicken cubes and onioins until they are cooked, along with considerable amount of lime zest, and some lime juice until it has a lime fragrance. Add more coconut milk and bring to a boil. Next add green and yellow peppers, and the eggplant. Add all of the coconut milk a little at a time as it boils. 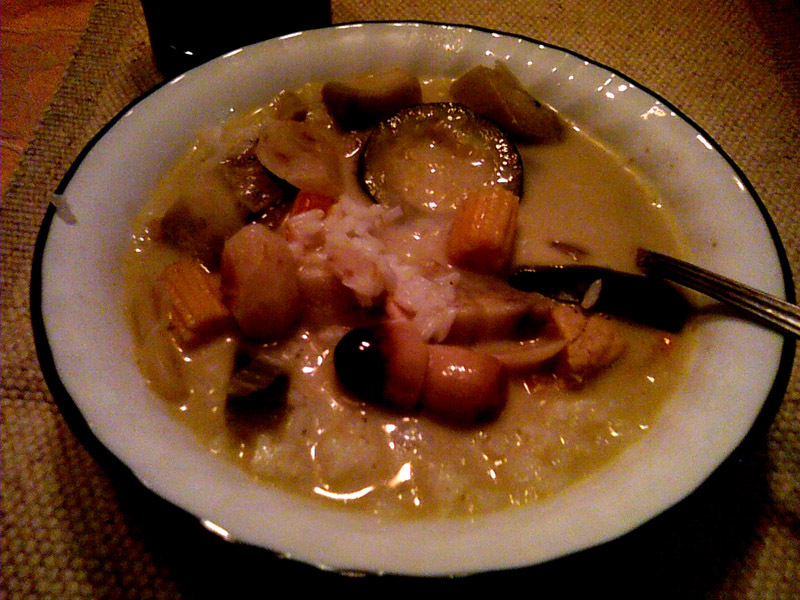 Add corn cobbs, water chestnuts, and straw mushrooms, and all of the water contained in the cans(this adds to flavor). Add fish sauce, and coconut sugar, as much as you like. Let cook until all of the vegetable are cooked. Serve over a bowl of rice. 3/4 cup of fresh chunk pineapple or a can of pinapple chunks unsweetened. First stirfry the curry paste, the ginger, and the habeneros in the peanut oil until fragrant. Next stirfry the onions for a few minutes, then add the two cans of coconut milk. Add some lime zest and some lime juice. Add the chicken and the peppers until cooked. Last add the shredded coconut, the pineapple chunks, and the juice, and let simmer for 20 minutes. Cook down until the sauce thickens. First throw the 2 boxes of chicken broth in a large soup pot along with some water. Add the cut up asparagas, sliced jalapenos, and a few splashes of fish sauce, black pepper and some salt. Season to taste. Bring to a boil. Allow the asparagas to cook. 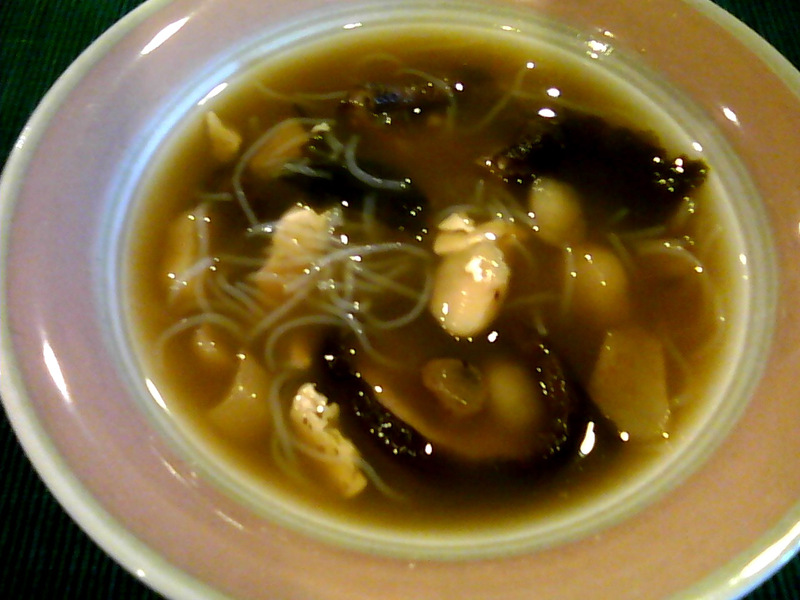 Then add the mushrooms with can water, and the bean thread noodles. Along side of boiling the soup stirfry the shallots in the oil with the garlic, and a few spashes of fish sauce, then add the crabmeat, and stirfry until fragrant for one or two minutes. While the soup is boiling add the shallots, and the crabmeat stirfry to the pot. Stir. Then add the beaten eggs, then the cornstarch mixture. Last add the cilatro, and the scallions while the pot simmers. Add more water to go farther, or some chicken broth if the noodles take over. Serve with fresh bean sprouts, and sliced fresh jalapeno, with lime on the side(optional).